Also contains CoQ10 for intensive anti-aging antioxidants, delivered efficiently in concert with the squalane. Include HABA Squa Q10 in a daily regimen that includes exfoliating, toning, and moisturizing - add any of the HABA Special Care products to focus on specific trouble spots. 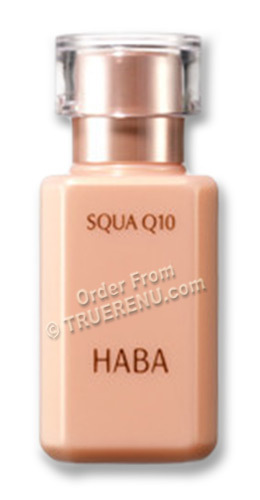 HABA Squa Q10 is an intensive anti-aging treatment, combining the penetrating qualities of purified squalene with the dramatic antioxidant and wrinkle fighting properties of CoQ10 (Coenzyme Q10). To learn more about HABA, see the entire TrueRenu storefront and toss a Trial Sample Set in your shopping cart. Squa Q10 is intended for post-cleansing and moisturizing intensive focus. Squeeze no more than 3 drops on moist hands, or add a few drops of water and pat onto face and body. Ingredients: SQ, ubiquinone (Coenzyme Q10 or CoQ10), tocopherol.